Edwin Pounds and Sons of Bradford have come to Superior UK for their fleet and family vehicles since 2004. Company Director (and fourth generation family member) Simon Broome tells us why loyalty, trust and longevity matter in ongoing supplier relationships. Edwin Pounds and Sons are now on their third full fleet from Superior UK, and last year took delivery of the new generation E Class hearse and limousine with their distinctive single headlamps, Sport style grille and panoramic glass roofs. Last year it became time to upgrade the existing Vito removal vehicle to a newer, more spacious model. 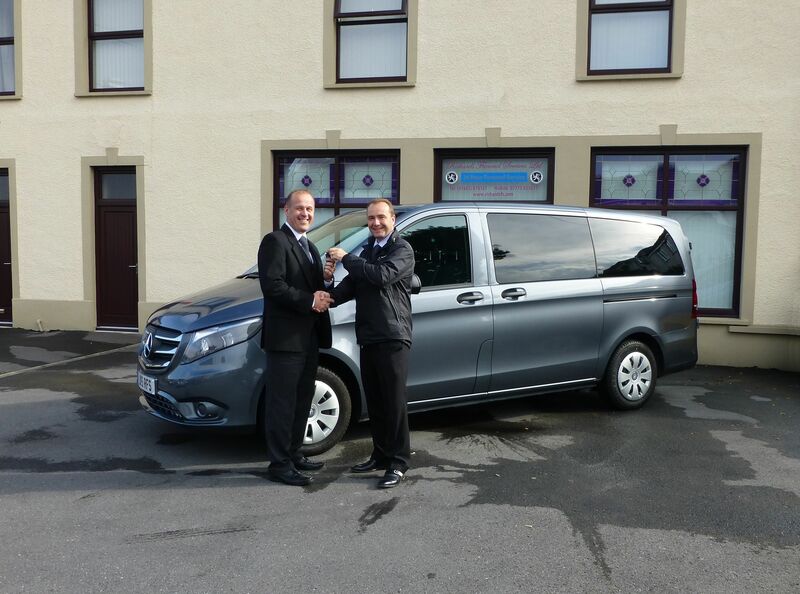 With the help of Kevin Smith at Superior UK, they ordered a brand-new Vito 114 BlueTEC. The firm’s new Vito is the new 114 shape, with aluminium wheels, automatic drive, and of course air conditioning! Like its predecessor, it was custom-built to Simon’s specifications with the build overseen by Kevin Smith at Superior. Edwin Pounds and Sons was established in 1904 as a farm, coal business and carriage providers by Edwin Pound, Simon’s maternal great-grandfather, who added funeral work to the business in 1940. Edwin Pound and Sons is now run by Simon, with support from his family and the team, and occupies a large site which was rebuilt in 2009. Busy Welsh funeral firm Richards Funeral Services Ltd serves a large area of the Cynon Valley. So their fleet needs to be reliable, with a professional look that honours this deeply-rooted community and give the families they serve the service they deserve. James Richards, Director and Owner at Richards Funeral Services explains why he made a big decision when it was time to purchase a replacement removal vehicle. The lifting system on Richard FS’s self-build van conversion was solid but basic. James had a look at some other vehicles including the Ford Transit, which had great reviews, but decided to approach Superior UK to discuss a Mercedes-Benz Vito. James’s key requirements were: exacting Health and Safety standards, an improved lifting mechanism for the vehicle’s top deck, and a professional look which matched his existing Mercedes-Benz fleet. After Kevin Smith of Superior UK had visited Richards Funeral services in Aberdare, James made the trip to Reading to see a selection of vehicles and view the workshop. As the third-generation of this established family business, James knows that reputation and trust are key to longevity. “The new Vito, and its lifting system, also looks a lot more professional when families see us doing a removal. And that’s what it’s all about,” he said. “We are here to serve the public as best we can, and the families are paramount to the success of our firm.